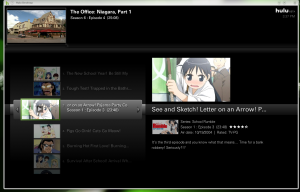 Hulu, which is pretty much shaping up to be part of the future of IPTV as we know it, released a client for Linux. They released 64 and 32 bit client packages for Ubuntu and Fedora based Distros. I tested it on Linux Mint 7 which is a fork of Ubuntu. It’s Pretty Solid. I expected issues but it ran smooth, I’m on a Quad Core machine so I have no idea how it would run on a lesser machine. It has a great anime selection, many of them in Japanese which is how I prefer it. And it’s Free. So.. I Suggest if you have a pc and love to watch TV on your own terms but don’t necessarily want to deal with cable or a DVR, give Hulu desktop a try.